Hitachi's DH38YE2 spline shank rotary hammer is the next generation in Hitachi hammer technology. Compared to its predecessor the DH38YE, the DH38YE2's power is packed into a more ergonomic body that is 2.9 lbs lighter, delivers less vibration and a lower noise level. 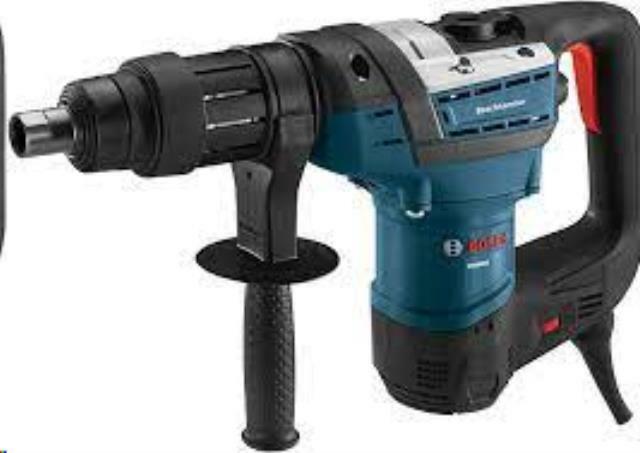 A simple turn of the knob changes the mode from hammer drilling to hammer only, allowing the DH38YE2 to take on a variety of tasks including; drilling holes in concrete for anchors or rebar, demolishing and chiseling concrete, cutting, digging, tamping or driving ground rods. The 8.4 Amp, 950 Watt motor produces 5.9 ft-lbs of impact energy and delivers fast drilling and chiseling. A dust-proof cover, sealed grease system and auto-stop brushes ensure high motor durability and minimal maintenance. A 360 degree side handle provides additional control, while the safety clutch shuts down rotation in the event of a bound bit. The DH38YE2 also includes a large injection molded carrying case with ample room for storage of bits, a side handle and other accessories. * Please call us for any questions on our rotohammer rentals in Tualatin and Eugene, serving the Portland Metro area, Eugene/Springfield Metro area, Oregon, and SW Washington.